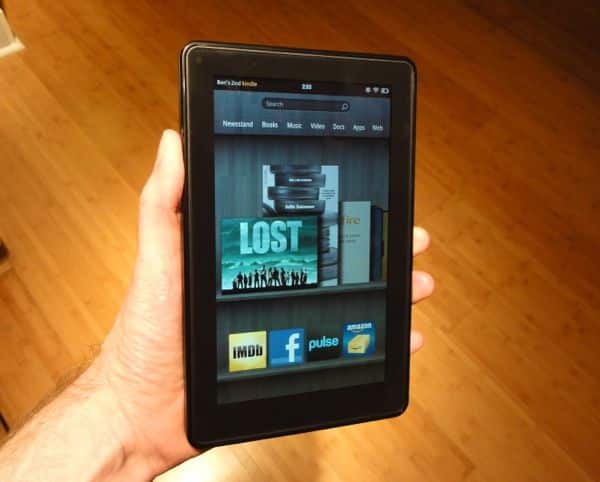 Smaller, lighter, and—most importantly of all—way cheaper than the iPad, Amazon’s new Kindle Fire tablet is shipping at last, and mine appeared on my doorstep early Tuesday morning. With a screen that measures just seven inches diagonally, the Fire (click here for more details and specifications) is considerably smaller than competing tablets like the iPad and the Motorola Xoom, and it’s also much lighter at just 14.1 ounces. But while the Fire is lighter than the iPad on paper, it actually feels heavier thanks to its smaller shell; indeed, with its 0.45-inch profile, the Fire feels decidedly thick and hefty. 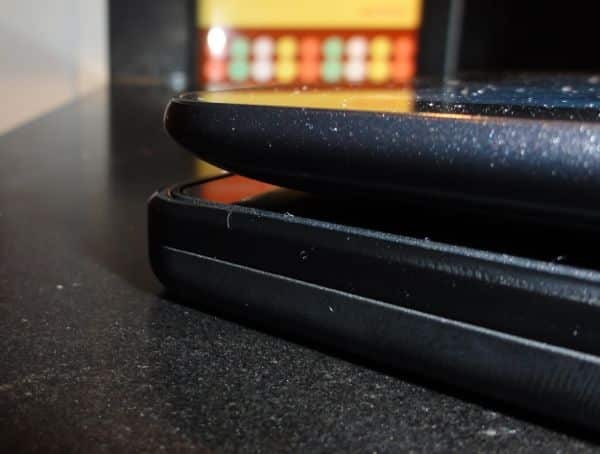 The Kindle Fire is thicker than its pricier competition, such as the seven-inch Samsung Galaxy 7.0 Plus (which is sitting on top). Now, it just so happens that I’m currently testing another seven-inch tablet, the Android-powered Samsung Galaxy 7.0 Plus—and at 12.1 ounces and just 0.39 inches thick, the Tab feels much more svelte than the Fire. Then again, Fire only costs half as much as the $400 Tab. So yes, the Kindle is bit on the heavy side, but it couldn’t make a better impression the first time you turn it on. Mine arrived already connected to my Amazon account, with the swipable “carousel” on the Fire’s home page already populated with all my Kindle books and music I’d purchased from the Amazon MP3 store. There was even a personalized welcome letter from Amazon boss Jeff Bezos, thanking me for my Fire purchase. Nice touch. Front and center on the Fire’s screen is the “carousel,” a flickable, rotating … well, carousel that displays the books, videos, songs, and apps that you’ve accessed most recently. Tap a book cover, album art, or a movie poster on the carousel, and zoom—you’re there. Want to jump from a book to a video, and back again? Tap the Home button at the bottom of the screen, flick to the video you want to watch, tap, and hey—you’re multitasking. The Kindle app on the Fire is similar to those you'll find on the iPad and Android tablets. You’d never know that the otherwise user-friendly Fire ran on Google’s Android mobile platform—that is, until you tap the Menu button and select Settings, at which point you’ll be confronted by a series of intimidating Android menu options. The settings in Android aren’t all that tough to figure out, but they might be overwhelming for anyone who’s new to tablets. I’ve you seen Amazon’s Kindle app for the iPad or Android phones in action, you’ve pretty much seen how Kindle books look on the Fire. No, there aren’t any fancy page-turn animations like there are on Apple’s iBooks app on on Google Books, but book text looks clear and sharp, you can change font sizes and background colors, and all your notes and bookmarks are synced with any other Kindle devices or apps connected to your account. 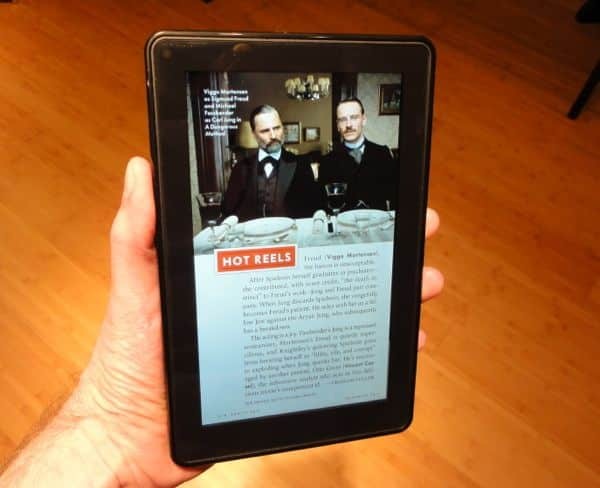 Magazines like Vanity Fair looks pretty sharp on the Fire's seven-inch screen. 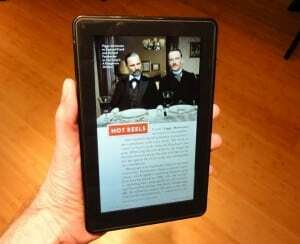 There are also about 400 magazines available for the Fire, and like the digital magazines for the iPad, the reading experience depends on how much work the published has put into their respective magazine apps. I checked out an issue of Vanity Fair for the Fire and found it to be virtually identical to its iPad equivalent—that is, thoughtfully formatted, tablet-friendly, and generally pleasurable to read. Amazon promised HD-quality video playback on the Fire, and so far, I like what I’m seeing. 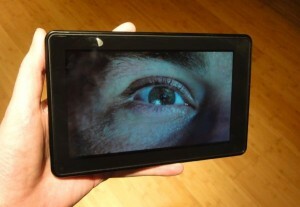 No, you’re not really going to get an HD picture on the Fire’s seven-inch screen, which lacks the resolution to display every pixel of a 720p image (and to be fair, Amazon only said the Fire can play HD videos, not that it can fully resolve them). That said, my eyes widened as I queued up an HD stream of “Lost” from Amazon’s video-on-demand service. The very first scene of Jack lying on the jungle floor as he awoke from the plane crash looked razor-sharp; indeed, I could make out each of his individual eyelashes during the famous close-up of his dilating pupils, while the thicket of surrounding bamboo shoots looked impressively detailed. The picture started to get a little blocky during as Jack dashed toward the site of the crash, but still—not bad for a streaming video. The Fire is capable of playing HD-quality videos, and yes—they look good. Amazon has thousands of movies and TV shows available for streaming on the Fire, although you’ll have to pony up $79 to watch its all-you-can-stream “Prime” videos, a service similar to Netflix’s Instant videos. The Fire also has a solid music player that connects to the Amazon MP3 store, perfect for quickly download tunes that you’ve already purchased directly onto the device. And while the Fire lacks a slot for microSD memory cards, it does come with a USB cable that you can connect to your Mac or PC for transferring tunes from your hard drive. When I plugged the Fire’s cable into my MacBook’s USB port, the Fire popped up as a drive on my desktop; from there, I started dragging and dropping MP3 into the Fire’s “Music” directory. Just don’t go too crazy with the file transfers, given the Fire’s somewhat stingy 8 GB of storage. Related: How big is a gig (GB), anyway? The bad news about the Android-powered Fire is that it lacks access to the hundreds of thousands of apps in the Android Market, Google’s equivalent to the Apple App Store. The good news, though, is that Amazon has its own, well-stocked version of the Android Market, including apps like Facebook, Netflix, Hulu Plus, Pandora, Words With Friends, and Angry Birds. The Fire’s built-in email and web apps are serviceable, although nowhere near as slick as the versions you’ll find on the latest Android tablets. You’ll also find a Contacts app, but no calendar—although again, you could always go find the calendar app of your choice in Amazon’s app store. While the Fire’s home page “carousel” spins nice and smoothly, everything else feels a little underpowered. 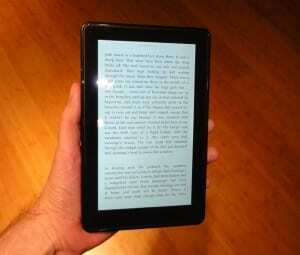 Turning a page in a Kindle book is a bit jittery, screen taps often take a second or two to register, and otherwise slick interface animations tend to look a little creaky. None of this renders the Fire unusable, of course, but it’s like the difference between a Corvette and a Chevette: one’s sleek, speedy and expensive, the other’s boxy, a little slower out of the starting gate, but far more affordable. A camera and a microphone, for starters. Also missing in action: 3G (meaning you’ll need nearby Wi-Fi to go online) and GPS (so no maps of nearby restaurants or museums). Ah, not so fast; like I wrote above, I haven’t even had the Fire for 24 hours yet. So far, though, the Fire is living up to my modest expectations. No, you won’t get the silky-smooth performance of higher-end tablets like the iPad 2 or the latest Samsung Galaxy tablets, but with its bargain $200 price tag—less than half the price of the cheapest iPad—you won’t have to empty your wallet, either. And if you think of it less as less of a productivity tool and more as a portal for countless hours of entertainment from Amazon’s various Kindle, video, and music stores, the Fire starts to get more and more interesting. Of course, the Fire won’t be the only bargain tablet coming out this holiday season; we’ve also got the upcoming Barnes & Noble Nook Tablet, which boasts the same size screen as the Fire, more memory (16 GB versus 8 GB), but also a slightly higher price tag ($250 instead of $200). So, any questions about the Fire? Let me know in the comments below, and I’ll investigate and get back to you.